The preferred technique for tooth replacement, dental implants offer a number of advantages to patients. They look good, they're long-lasting, and over the long-term, they"re more cost-effective than other alternatives. Dental implants are titanium screws that are anchored to the jawbone, so patients are only candidates for the treatment if they have enough underlying bone to house the screws. Some patients, such as those with periodontal disease, may not have enough bone structure for dental implants. Additionally, if the tooth has been missing for some time, and the bone has receded, dental implant placement can be problematic. Bone loss can be especially pronounced in the posterior section of the upper jaw as the jaw bone can be particularly thin in the area of the sinus cavity which lies just above the molars. This can be troublesome if the tooth that needs to be replaced is a molar. 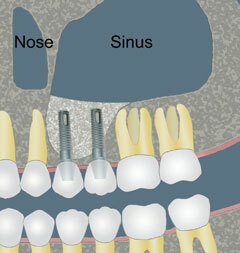 Fortunately, implant dentists can use sinus grafting to address this issue and add bone to support the dental implants. 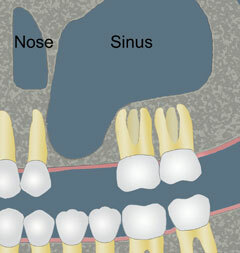 In a sinus graft, the soft sinus floor is essentially raised, encouraging additional bone growth in the area. An incision is made in the gums in the area below the sinus, and then cut through the bone to create a "window" into the sinus cavity. Bone graft material, which ultimately encourages thicker bone growth, is then placed in the area, and the incision is then sutured. 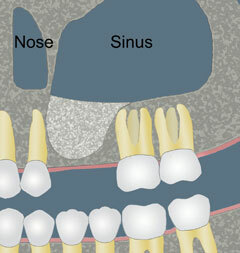 A sinus graft can take place under local anesthesia. Sinus grafting may extend the overall treatment as it takes time for the bone to mature after the initial sinus lift before the dental implants can be placed. However, in some situations it may be possible to place the implants during the augmentation surgery and thus avoid the additional healing time and a second surgery. Each case is different.